Cinco de Mayo and Derby Day in one weekend! - I see better from a distance. Cinco de Mayo and Derby Day in one weekend! 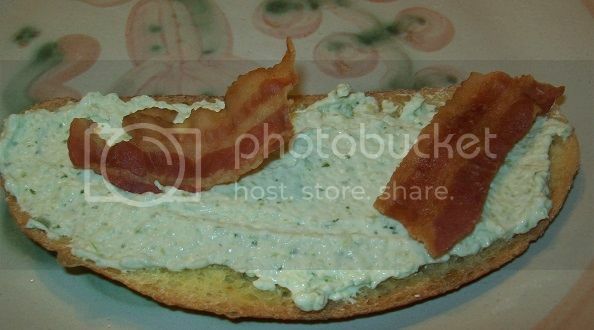 Had a great time cooking my usual Louisville themed meal- Hot Brown, Benedictine spread, and "Derby" Pie. And I enjoyed the race. I hope Derby winner Orb has a real shot at the Triple Crown! Got really sick overnight, so I didn't get to do anything special for Cinco de Mayo. I was hoping to at least get a good margarita somewhere. Oh, well. 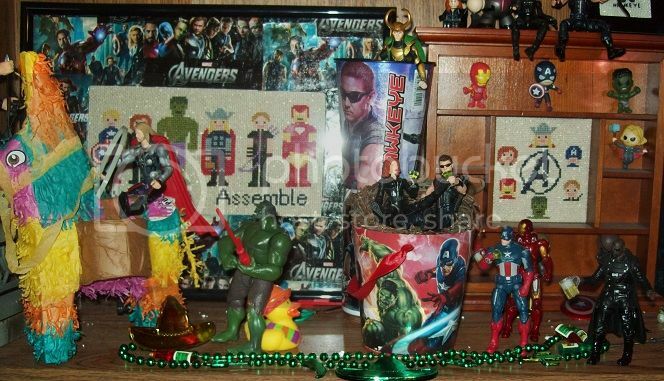 My Avengers figures had their own little party instead. The pie. 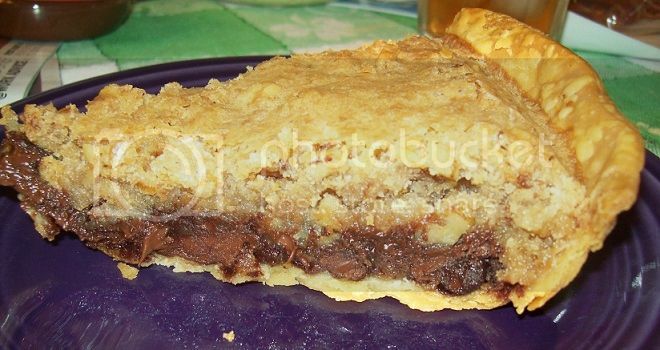 This was a different recipe, one more like the original pie from Kern's Kitchen. Rory attacked me when he saw I was grating Parmesan cheese for the Hot Browns. 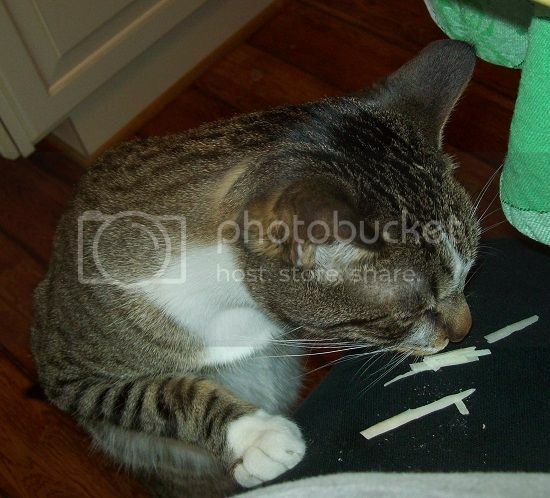 I gave him a few shreds. Benedictine- this was the best I've made in years. I don't know what I did differently. 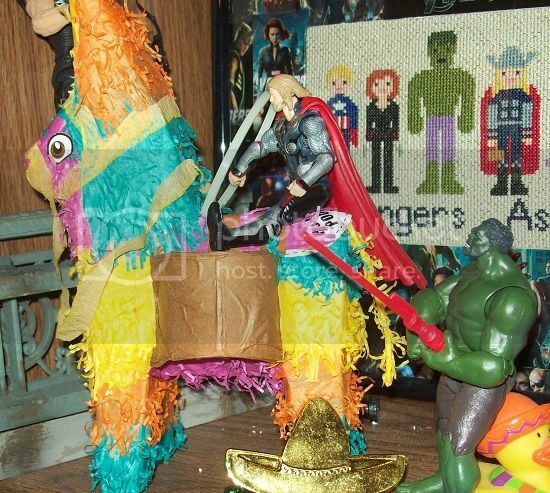 The Avengers had a Cinco de Mayo celebration, complete with margaritas and a pinata. No, Hulk! Don't smash Thor! Thor thinks the pinata is a fine riding beast. 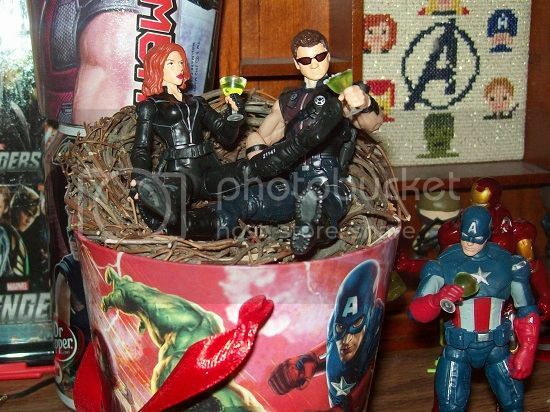 Clint and Tasha enjoy their margaritas, but Cap isn't sure what to make of his. 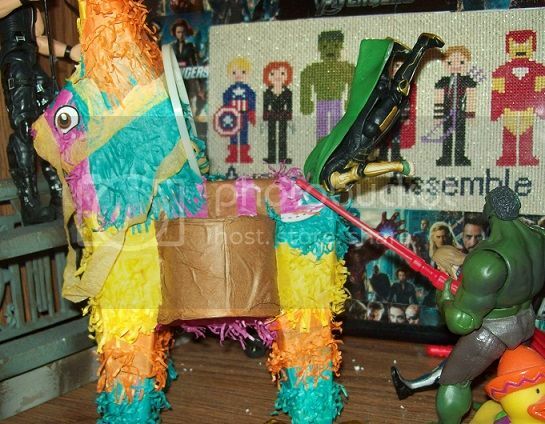 Okay, now Hulk can smash Loki-pinata!